At the southern feet of the precipitous Ailao Mountain (āi láo shān 哀牢山), there extends a vast stretch of beautiful richly endowed and mystical land. It is the Honghe Autonomous Prefecture of Hani an Yi Nationalities (hóng hé hā ní zú yí zú zì zhì zhōu 红河哈尼族彝族自治州), which like a piece of green precious stone inlaid at the southernmost end of China. The Honghe River (hóng hé 红河) flows from the west to the east across the prefecture. Found in this area are dense tropical rain forests like many green peaks rising one higher than another, immense variety of karst landforms, many deep mirror-like plateau lakes, magnificent views of seas of clouds in the valleys and ravines, tiers upon tiers of terraced fields which reach to the sky, and rich rare-metal resources renown home and abroad. Honghe Prefecture is located in south of Yunnan province with a borderline of 848 kilometers. It borders with 6 counties, two provinces and Republic Vietnam. There are two first-grade trading ports of the State, namely Hekou (hé kǒu 河口) and Jinshuihe (jīn shuǐ hé 金水河). It covers an area of 32931 square kilometers and administrates three cities, namely Mengzi (méng zì 蒙自), Gejiu (gè jiù 个旧) and Kaiyuan (kāi yuǎn 开远), 7 counties namely Jianshui (jiàn shuǐ 建水), Shiping (shí píng 石屏), Mile (mí lè 弥勒), Luxi (lú xī 泸西), Yuanyang (yuán yáng 元阳), Honghe (hóng hé 红河) and Lvchun (lǜ chūn 绿春), 3 autonomous counties namely Hekou Yao Autonomous County (hé kǒu yáo zú zì zhì xiàn 河口瑶族自治县), Jinping Miao, Yao and Dai Autonomous County (jīn píng miáo zú yáo zú dǎi zú zì zhì xiàn 金平苗族瑶族傣族自治县), and Pingbian Miao Autonomous County (píng biān miáo zú zì zhì xiàn 屏边苗族自治县). Besides Han nationalities there are 9 other ethnic minorities .i.e. Hani (hā ní zú 哈尼族), Yi (yí zú 彝族), Miao (miáo zú 苗族), Dai (dǎi zú 傣族), Zhuang (zhuàng zú 壮族), Yao (yáo zú 瑶族), Hui (huí zú 回族), Lahu (lā hù zú 拉祜族) and Buyi (bù yī zú 布依族), that dwell in the prefecture, and the main are Hani and Yi as well as Hui minorities. Honghe is situated in the region of plateau monsoon with low latitude and with the Tropic of Cancer crossing through its middle continent. Topographically it has various types of topography ranging from high mountains with the altitude of 3074.7 meters to river valleys of 76.4 meters. Vertically tropical and subtropical climates are dominated with dry and wet seasons, which make the weather neither very hot in summer nor cold in winter. Therefore all four seasons are like spring. The climate may change dramatically at different altitudes .Thus it is said "there are four seasons in a mountain but the climate is different within 5 kilometers". 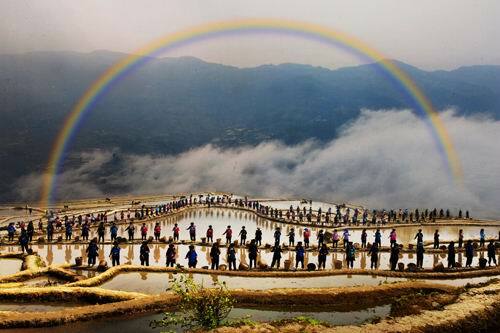 Honghe Prefecture is one of the places with abundant tourist resources in Yunnan province. Tropical rain-forest, karst formations, plateau, lakes, gorges, “clouds sea” phenomenon and tiers of terraced fields form its unique tourist attractions. It is like a fairyland and a wonder in South China. 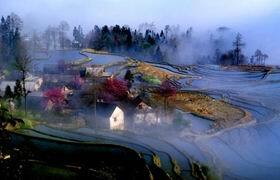 The terraced fields are encompassed by mist and cloud. They look like the ladders to the paradise. Honghe is a magical and beautiful gem inset in the southern frontier of China. Although the Honghe prefecture is located in the southern frontier of China, it has been deeply influenced by the culture of the Central Plains since ancient times. A lot of famous human and historic landscapes have formed here. In addition, these landscapes have a rich connotation and special style. They blend perfectly with the culture of the Central Plains together. All these landscapes offer the best scenery in Yunnan. 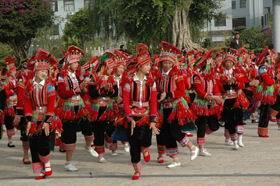 Honghe Hani & Yi Autonomous Prefecture is one of many regions where the society, economy and culture have developed early in Yunnan province. The discovery of the fossils of the ancient Lama apes in Kaiyuan has proved that Honghe region is one of the human birth-places, Jianshui, Mengzi, and Gejiu has been respectively made the center of politics, economy and culture of south Yunnan. Shiping has been historically praised as "the first state for its literature and there is no superior to it in south Dian (Yunnan)". Jianshui is famous for its ancient city. Mengzi is also an old county which was once an important trading port and the capital of Honghe Hani & Yi autonomous prefecture. Gejiu, the "Tin Capital" (xī dū 锡都) famous both home and abroad, with a mining history dated back to 2000 years ago in Han Dynasty, is now a metallurgical industry city in which nonferrous metals are mined. Its major product is tin, and its output ranks the first in the whole country. Along with techniques improved in mining, sorting and smelting, Gejiu is famous in the world for its increasing quantity and good quality. It is also the main industrial area in south Yunnan. Kaiyuan, Located in a low basin surrounded by mountains, anciently called "Ami State" (ā mí zhōu 阿迷州), now another industrially booming city after Gejiu, is now an important base for energy, chemistry, construction materials, and also a hub of traffic communication and a goods distributing center in south Yunnan. 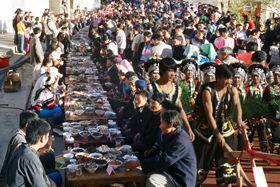 The diligent and intelligent people of different nationalities in Honghe prefecture have created the colorful and splendid minority culture during the long history. Different ethnic minorities have different housing, costumes and courtesy. The unique wedding ceremony, the magnificent view of the terraces of rice-fields, the tobacco-box dance (yān hé wǔ 烟盒舞) and the "Axi" dance in moonlight (ā xì tiào yuè 阿细跳月) are all full of poetic charm and a painting grace of nationalities' customs in south Yunnan. The terrace fields, a wonder among the Ailao mountains, are like numerous silver ladders, climbing from the bottom of the mountains to the top. They are not the natural gifts but the carvings done by the generations of the intelligent Hani people. The town of Mengzi (méng zì 蒙自) is located in the east of Honghe Prefecture and southeast of Yunnan Province, covering a total area of 2228 square kilometers. There are 19 nationalities in this area, such as Miao, Zhuang and Hui. The town of Mengzi has a population of 390,080 thousand in total. Since Mengzi is on the plateau at low latitude, it has a subtropical monsoon climate. The annual average temperature is 18.6℃ and the annual average sunshine time is 2,234 hours. Mengzi is pervaded by places of historic interest and scenic beauty. 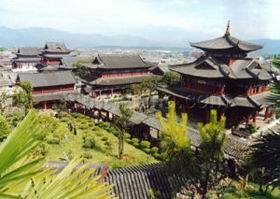 From the geographic aspect, Mengzi has very important position in Yunnan. It is the gateway of China’s southwestern area and the countries of Indo-China Peninsula, so that Mengzi is celebrated as one of the three logistic centers of Yunnan Province. Besides, the strategic position of Mengzi is also important. Since there have always been a large number of garrisons in Mengzi through the ages, the town has been hailed “China’s Soldier Town”. In the year 1915, in Mengzi, the famous Chinese general Zhu De (zhū dé 朱德) headed the troops to crusade against Yuan Shikai (yuán shì kǎi 袁世凯), who wanted restoration of a dethroned monarch. Mengzi has a long history of 2,110 years and flourishing culture. There used to be human beings inhabited here thousands of years ago. At present, there is one site which has been listed as important cultural relic sites under state-level protection by the Central Government, six sites which have been appraised as the important protection unit of cultural relic of the province and three patriotism education bases. Through thousands of years, Mengzi became richer and richer in multi-cultural heritages, including the cultures of borderland, central plains, communist party and western world, making Mengzi have great potentiality of development. Mengzi has a wide stretch of land and a great variety of natural resources, making Mengzi a great place for living and pioneering work. Mengzi is the home of the famous Yunnan Bridge-crossing rice noodles (yún nán guò qiáo mǐ xiàn 云南过桥米线), one of the six pomegranate producers and one of China’s top 10 agricultural tourist demonstration centers. By the year 2020, Mengzi is planned to become a modern garden town with beautiful environment, distinctive characteristics, flourishing culture and marvelous living conditions in southern Yunnan. 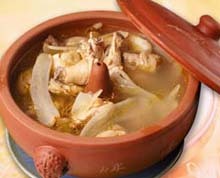 Steamed Chicken (qì guō jī 汽锅鸡) is a unique flavor dish in Yunnan . The source of the dish is Jianshui in Honghe. It belongs to a noted dish in the south of Yunnan. It’s called as “the first dish in South Yuan”. It’s rated as “the state banquet dish”. It’s said that the dish was invented by Yangli (yáng lì 杨沥) who was born in Jianshui. It has a history of more than 200 years. Steamed Chicken is cooked with some rare medicinal materials, such as, notoginseng, gastrodia tuber and Chinese caterpillar fungus. So it’s called the Notoginseng Steamed Chicken, the Gastrodia Tuber Steamed Chicken or the Chinese Caterpillar Fungus Steamed Chicken. It has the function of replenishing Kidney. Mengzi Rice Cake (méng zì nián gāo 蒙自年糕) uses first-class glutinous rice as raw material. Mix it with brown sugar or white sugar, sesame, rose, shelled peanut and ham. Fry it with oil. It’s crisp outside and glutinous inside. It’s very fragrant and sweet. It’s very tasty. It is a kind of snack food uniquely in Honghe. If you have chance to be at the snack market in Honghe, remember to experience it yourself. Shiping Roast Bean Curd (shí píng shāo dòu fǔ 石屏烧豆腐) is a unique flavor snack of Kunming (kūn míng 昆明), Tonghai (tōng hǎi 通海), Yuxi (yù xī 玉溪) and Shiping. It can be made after special process. Make salt and smelly bean curd at first. Then, roast it until two sides of the bean curd become golden in color. Eat it with all kinds of seasoning. 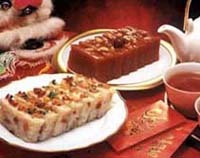 Lion Cake (shī zǐ gāo 狮子糕) is a traditional noted snack in Jianshui County. It’s said that it was ascribed to a man working in “the Rong Xiang Zhai” (róng xiāng zhāi 荣香斋), whose family name was Wu (wú 吴). Because it looks like the hair on the lion’s neck, it gets the name of Lion Cake. It uses choice glutinous rice, rice-made maltose and a touch of sucrose as raw materials. Dip glutinous rice in the clear water for ten to fifteen days first. Steam it then. Roll it into a ball. Press, shred and then dry it in air. Fry it in the pan. After it cools off, wrap it with 80% maltose and 20% sucrose. Squash it. Cut it into pieces. It’s crisp, sweet and fragrant. It’s delicious. It has the same color as silver. It's as bright as a mirror. Dazzling tin handicrafts have unique artistic features. It's resistant to alkali. It's non-toxic and stainless. It's of extremely high ornamental and collection value. The clear Mayu Tea (mǎ yù chá 玛玉茶)gives out a full aroma of honey. It's tasty. The tea leaf is tender and bright. The teacup that is often used to make Mayu tea becomes seldom encrusted. This is the unique characteristic of Mayu Tea. Yunwu Tea (yún wù chá 云雾茶) is green. It gives off a fragrant odor. Its taste is strong. It has the functions of promoting salivation, quenching thirst, promoting digestion, increasing the discharge of urine and improving acuity of vision. Jianshui purple pottery is considered to be among the four famous types of Chinese pottery, including Yixing pottery (yí xīng táo 宜兴陶) from Jiangsu Province (jiāng sū shěng 江苏省), Qinzhou pottery (qīn zhōu táo 钦州陶) in Guangxi Province (guǎng xī shěng 广西省) and Rongchang pottery (róng chāng táo 荣昌陶) in Sichuan Province (sì chuān shěng 四川省). Purple Pottery’s surface is glossy. It smacks of antiquity. It has properties of being acid-base-resistant, lead-free. It can be used to decorate the house and has practical application in our daily life. The Dianyue Railway (diān yuè tiě lù 滇越铁路) (Kunming - Hanoi) is a main railway in Honghe Prefecture. It was built by Frenchmen in 1908. It’s one of the only two narrow-gauge railways in the world. It’s also the only international railway in Yunnan at present. It connects Yunnan with some countries in Southeast Asia. 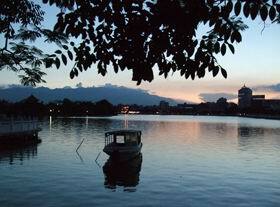 The train departs from the Kunming Northern Station and reaches Hanoi in Vietnam, via Kuaiyuan, Mengzi and Hekou. It’s 460 kilometers from Kuming to Hekou. The train runs the course in 17 hours. However, 10 hours is enough to runs it by bus. One wonder in “Eighteen wonders in Yunnan” (yún nán shí bā guài 云南十八怪) is that a railway leads abroad instead of home. 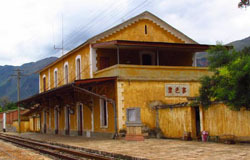 The railway referred to is the narrow-gauge railway in Yunnan. In addition, there is another railway in Honghe Prefecture. It’s the Mengbao Railway (Mengzi-Baoxiu). It starts from the Bisezhai Railway Staion (bì sè zhài huǒ chē zhàn 碧色寨火车站) which is on the Kunhe Railway and ends in the Baoxiu Rialway station (bǎo xiù huǒ chē zhàn 宝秀火车站), via Mengzi, Jiejie (jī jiē 鸡街), Jianshui and Shiping. The overall length of the railway is 142 kilometers. If you take the train, you can visit one of the earliest railway stations in modern Chinese History - the Bisezhai Railway Station by the way. The inquiring number of the Kaiyuan Railway Station: 0873-7125483. The number of the Passenger Transport Section of Kuaiyuan Railway: 0873-7125793. The inquiring number of the Hekou Railway Station: 0873-3422855. The inquiring number of the Jianshui Railway Station: 0873-7652284. Long-distance coaches shuttle back and forth across the whole province. The coaches which are bound for Honghe are centered largely in the Yunnan Tourist Bus Station (it’s located in No.663, Minghang Road, Shangguan). The Inquiring Number of the Gejiu Long-Distance Bus Station: 0873-2222091.